In A Page from History, I introduce the concept of a false flag attack on the Dreadfort. Such an attack seems to be the only viable option for advancing Stannis’s campaign against Roose Bolton. More accurately, I proposed two different ways in which this plot could be carried out—one using wildlings and the other involving the ironborn. Why would the wildlings and Stannis ally for such a venture? How would such a plot be carried out? Val escaped from Castle Black. This seemingly incredulous idea underscores the basis for any such theory of a wildling mission—regardless of motive. There is ample evidence and implications of a secretive plot involving Val at Castle Black. When we take stock of these details, carefully surveying them in their totality, the probability of Val’s escape is becomes almost irrefutable. Val is a member of a conspiracy which includes Stannis, Mance and Melisandre. Val’s escape attempt was a planned element of that conspiracy, carefully coordinated by the other members. Her escape was part of an effort to send a contingent of wildlings to the Dreadfort, or at least engender the appearance of doing so. Remember that this essay is only the first in a series which establish the “wildling mission” theory. Some of the ideas and claims made herein will seem unsubstantiated. The arguments and evidence in favor of such claims are provided in the subsequent entries in the series. Thus if you find some of the premises used herein to be fallacious, I beg that you continue on to the next essay, Honor has its Costs. I believe you will find most of those concerns relieved after reading both pieces. Rumors of Conspiracy. The initial proof of secret collaborations involving Val; justifying further inquiry. A Princess Indeed. Explaining why Stannis insisted on Val’s royal treatment; securing the loyalty of the wildlings. Escapism. The significance of Val’s wavering obedience, weaving the evidence of a secret alliance. Where There is a Will. Establishing the window of opportunity for an escape. A White Wedding. The implications of Val’s quest and her changing appearance, suggestions of a marriage. The Warrior Princess. A symbolic relationship between Val and a Targaryen princess. A Crow Husband. Revealing the lucky groom. Chieftain Loyalty. Further implications of a wildling allegiance to Jon. As I claimed above, I believe that Val is in secret collaboration with others, specifically with Stannis—quite possibly Melisandre and Mance Rayder as well. Prooving the existence of Val’s secret connections is our first stop on the journey to Val’s escape. How could Val be a member of any conspiracy? Where’s the evidence? Now… remember that Stannis is notably close-mouthed regarding his plans: refer back to Subverting Betrayal if you need more details (specifically his commentary to Richard Horpe regarding whether Arnolf Karstark told his men about their plot). Furthermore, the king’s immediate inquiry into the source of the rumor is incredibly incriminating: it strongly suggests that the rumor is true. This is hardly a difficult inference to make, the subtext is clear. Notice that in this instance, Stannis doesn’t show a whit of concern that the rumor has spread. Constrast that with the previous rumor and you can quickly see that Stannis is far more concerned with the ramifications of the rumor—strongly suggesting that it is true. Kings should reward the loyalty of devoted bannermen with lands and castles. Stannis plans to reward wildling chieftains—Rattleshirt and Sigorn of Thenn—with lands and castles. Thus, both of these chieftains are loyal to Stannis—somehow performing a service that warrants rewards. However, neither chieftain appears to directly contribute to Stannis’s campaign in A Dance with Dragons. This alone alludes to the possibility of a secret collaboration. If Stannis keeps his secrets close to his chest, then how did Gilly learn of these plans? Gilly is one of the only people who has free access to Val—a consequence of nursing the wildling children. The only other person who would have free, private access to Val is Stannis himself, possibly Melisandre as well. This suggests that Val knew about the promised lands and castles prior to JON I — ADWD… and the only persons who could have informed her of any such offers would be—as noted—Stannis or Melisandre. Why would Stannis be talking to Val about offering castles to Rattleshirt and Sigorn of Thenn—instead of (or in addition to) talking to the chieftains themselves? Why would Stannis need to keep this a secret? Stannis was negotiating some sort of pact between himself and wildlings. Val appears to be an important figurehead, somehow an integral component with regards to securing the loyalty and/or assistance of the wildling tribes. The reason for these negotiations is explored later in this essay… for now it is only important to recognize that Stannis and Val engaged in some sort of secret dialogue. If Gilly was present at the conversation between Val and Stannis, it only substantiates my point about private negotiations between the two. If Gilly was not present, then we obviously know that Val told Gilly all of these details, once again supporting my argument that Val is Gilly’s source, and subsequently this again supports my claims about private negotiations between the king and the wildling princess. Given that Stannis had no clue who Gilly was and his apparent concerns about the rumor, I am inclined towards the latter option. It seems unlikely that Stannis would discuss major details of any secret alliance while a wetnurse was present. Regardless, Val is now worthy of suspicion—I believe that this point has been convincingly made. We must move on and look at other elements of her character before we can return and explore the nature of this conspiracy further. Before departing for Deepwood Motte, Stannis made one thing perfectly clear: Val was a wildling princess. No amount of plain logic could convince him otherwise. As deaf as Stannis seems in this regard, he’s actually right. The rationale by which Stannis makes this conclusion apparently escapes everyone despite the fact that it’s right in front of them. Stannis wants the wildlings to commit to his cause. Specifically, he does not care for their admiration, but he does care for their compliance. To that end, he’s willing to do what facilitates that compliance. Why would Stannis negotiate with Val instead of simply negotiating directly with Rattleshirt and Sigorn? Val has no individual sway over the wildling chieftains or their men: if Stannis does want their swords why would he waste his breath discussing such details with Val? Stannis believed that Val could unify the wildlings. The evidence in this section will testify to that claim. Throughout The Mannifesto, I’ve shown that Stannis often uses deception when he wants to realize the best of two options. The most prominent example of this is when Stannis both executed Mance Rayder, and secretly spared his life (which I discussed at length in Operating in the Dark). Confirm his authority and justice by executing the law as expected, with the aim of garnering wildling submission and renewed “faith” among his men. Retain the many benefits provided by Mance’s continued survival. Indeed he got both of these: Stannis’s deception was extremely beneficial. How does this relate to Val? Having shown Stannis’s willingness to “cheat the system” to get the best of two options, I can show you that he does the same thing with Val. When Stannis burned “Mance”, Stannis loomed over the event from atop a wooden platform raised above the proceedings. All of the wildlings who wished to traverse the Wall had to kneel before him on this platform, to indicate their acknowledgement of his rule. She [Melisandre] stood at the king’s side on a wooden scaffold raised above the pit. Val stood beside him [Stannis], tall and fair. What makes Val so special that she needs to be atop the king’s scaffold during the execution? If, as Jon has stressed multiple times, Val is not a princess nor a wildling of any special significance… why is she standing next to Stannis atop the platform? By standing on the scaffold with Stannis and Melisandre, Val is implicitly endowed with the same semblance of royalty, power… authority. The text seems to imply that Val stands there for ceremonial reasons. But this is wrong. How then did the wildlings reconcile themselves with the shameful act of perceived subservience? With the insurmountable evidence that the wildlings despise “kneelers” and especially being forced to choose Stannis as king, does it not make sense that Val’s presence on the platform affords them a viable ‘excuse’? Indeed, with Val standing next to Stannis, it would be easy to see that some wildlings may consider that they were kneeling in deference to Val instead. Sigorn of Thenn and Mance/Rattleshirt are the first two to kneel, and it’s entirely possible that kneeling to Val was precisely what one or both of them preferred to believe. Isn’t it extremely conspicuous that the two men to kneel before Val first just happen to be the same ones rumored to be eventually rewarded with lands and castles—a detail we know to be something Val is aware of? Prior to the execution, Val repeatedly attempted to escape. We also know that Val begged for Mance’s life and that Stannis negotiated with her in secret. Might Val’s newfound solemnity during the ceremony indicate a pact was indeed secured between herself and Stannis? It would certainly seem that Val did strike an accord with Stannis by the time of Mance’s falsified execution. All of the observations made thus far render this conclusion extremely likely. Jon had once heard Mance Rayder say that most kneelers were sheep. “Now, a dog can herd a flock of sheep,” the King-Beyond-the-Wall had said, “but free folk, well, some are shadowcats and some are stones. One kind prowls where they please and will tear your dogs to pieces. The other will not move at all unless you kick them.” Neither shadowcats nor stones were like to give up the gods they had worshiped all their lives to bow down before one they hardly knew. A clever implication of the bolded sentence is that the wildlings would bow down before someone they did know. Of the three on the platform overlooking Mance’s “execution” there was only Stannis, Melisandre and Val. Since the wildlings knew Val, it seems extremely plausible to believe that the wildlings reconciled themselves with kneeling only because they could believe that they were bowing to Val. “Free folk do not kneel,” Val told her. Since they did voluntarily kneel after Mance’s fake execution, it makes sense that they did indeed “choose” her. Not only am I saying that the wildlings knelt before Val and not Stannis, I’m saying that Stannis was aware of this: her presence on the platform was by his design. Stannis fully intended for the wildlings to in truth be declaring loyalty to Val. Stannis negotiated for wildling loyalty with Val, on the basis that the chieftains would declare their allegiance to her. Their service to Stannis would be compensated with rewards of land and castles. Val’s compliance would be assured by Mance’s survival. Lastly, the wildling pact would be cemented by marriage. These conclusions explain so much as to be almost certainly accurate. A particular highlight is that it explains the insistence on calling Val a princess: Stannis wants to cloak Val in an aura of authority and respect. This also explains why Stannis is so insistent—and particular—that marrying Val is the only thing that can ensure peace with the wildlings: because he’s already made her the focal point of the wildling factions. Still doubt that Val became the secret, de facto figurehead of the wildlings? Think about this a moment: Stannis clearly implies that he planned on taking Val with him on his march—only deciding to leave her behind when he leaves the wildlings with Jon. Didn’t Stannis just argue that he needed to marry Val to someone like Arnolf Karstark, as soon as possible? Why leave her just because the wildling forces are being left behind? Despite being a prisoner, Val is somehow central to the wildling forces. And Stannis knows this. The discoveries of the pact between Stannis and Val and that Val the centerpiece of this alliance have astounding ramifications. We have to wonder what he might use such an allegiance for. Another sign that something is afoot quickly emerges once you scrutinize Val’s changing obedience and candor throughout A Dance with Dragons. This strongly suggests agency: that Val is not dependent on a man, Val will take control of her destiny whenever she so desires. The last line here carries with at a very specific meaning: Val is not the kind of woman to wait for a man to rescue her. Jon implies that Val will escape on her own terms if she feels so compelled. All the same, the wildling princess was not beloved of her gaolers. She scorned them all as “kneelers,” and had thrice attempted to escape. When one man-at-arms grew careless in her presence she had snatched his dagger from its sheath and stabbed him in the neck. Another inch to the left and he might have died. If Val wants to escape, she’ll attempt it herself. Val is only a submissive captive as long as it serves her interests. “The crow commands, the captive must obey.” Her tone was playful. This dissonance between these statements and her prior escape attempts is jarring. How is this is the same woman that attempted escape three times and stabbed a guard in the neck? As I said, Val’s coy obedience despite a fierce desire for independence is something that should pique your interest—a small sign that something may be amiss. It should also be noted that this subservience only began to surface during Mance’s false execution. Recalling that Val is the lynchpin in the wildling alliance with Stannis, it is entirely possible that Val’s subdued behavior may be connected to the alliance’s purpose: that Val is not merely a playful captive—she is awaiting some signal to take actions, to enact some plot concocted with Stannis. There are wolves amongst these sheep, still. She was not wrong.The trick was telling one from the other, parting the sheep from the goats. It’s rather amusing that for a woman with such agency, Val’s statement implies that men are heroes and villains, liars, cravens or brutes. The omission of women just reinforces the inability of most men to perceive the possibility of a woman with her own agency. Laughably, Jon was right to say she was not wrong—but that does not mean she was entirely truthful either. Like so many men in A Song of Ice and Fire, it is this inability to perceive a woman’s agency is exactly what allows Val to manipulate Jon so well. Val plans on abusing Jon’s “blind spot” in some capacity. In his blindness to Val’s cleverness, Jon is subsequently unaware of a dangerous situation which blossoms underfoot: an opportunity for Val to once more indulge her desire for freedom, her self-determination—her agency. “How did you fare with Tormund?” asked Val. Why not? thought Jon. They are all convinced she is a princess. Val looked the part and rode as if she had been born on horseback. A warrior princess, he decided, not some willowy creature who sits up in a tower, brushing her hair and waiting for some knight to rescue her. “I must inform the queen of this agreement,” he said. “You are welcome to come meet her, if you can find it in yourself to bend a knee.” It would never do to offend Her Grace before he even opened his mouth. “Your Grace.” Jon knelt again. This time Val did not join him. For all of Val’s offers to ‘do more’ and ‘be a proper wildling princess’ she didn’t do much of anything—her ‘word’ was seemingly worthless. In fact, her presence at the meeting was actually detrimental: her biggest contribution was to bicker with Selyse—some might even say Val issued threats. Jon fails to think anything of the difference between what Val offered and what she actually contributed. You might agree with him, believing that Val’s behavior was trivial. Val’s lack of effort—indeed her outright antagonism—at Jon’s council with Selyse suggests that Val wasn’t actually there because she wanted to help him. Instead, Val was there to further her own agenda. “Twice as big as when you left us, and thrice as loud. When he wants the teat, you can hear him wail in Eastwatch.” Jon mounted his own horse. Is Val asking about her lodgings as they relate to her access to Mance’s “son”? In my opinion, yes. This is based on the tremendous political gain Val gathers by having access to the child. Val is using the fact that she found Tormund in order to shame Jon into some sort of compliance. Val’s implicit argument is for some semblance of freedom in exchange for her success. Not only is this an implied request, but Jon’s answer also tells Val where she will be in relation to Mance’s “son”. Once more, you can see how Val attempts to leverage Jon’s blindness to her agency. She abuses his transfixed attentiveness to her regal appearance to achieve a personal goal. This is not the only instance where Val leverages Tormund’s presence in an attempt to shame Jon and acquire some benefit. Furthermore, both instances of this shaming contribute to a massive strategic gain for Val, and whatever cause she serves. Val’s concern regarding greyscale may be entirely valid. That said, I don’t believe she is being entirely truthful about her concerns. Val accompanied Jon because she wanted to find any valid pretext to get Monster away from the King’s Tower. Val’s coyly asks for—and gets—increased freedom at Castle Black. This is the first time she leverages her success with Tormund for personal gain. She knows where “wildling prince” is being held: still in the King’s Tower. By leveraging her success with Tormund, as well as her fear of Shireen, Val demands—and gets—the wildling prince moved to her residence at Hardin’s Tower. Val has a fierce sense of agency—a trait she is curiously concealing from Jon Snow. Val wanted to reestablish unrestricted access to Mance’s “son”. Selyse resided at the King’s Tower with the baby, thus the baby was under extremely heavy guard. Val’s residence however was under only light guard, which included a giant and a wildling (Leathers). Val had earned herself freedom of the castle. This also moves both of the baby’s wet nurses to her tower as well. The light guard and increased freedom provide Val with newfound opportunities to escape—with the child in tow. You can probably begin to see the silhouette of Val’s escape plan. However, I wish to further explore her motives in this essay: the theorized details of her escape are presented in the following essay. Val is already married by the end of A Dance with Dragons. The likely partner in this marriage is completely unaware of said union. Once again I introduce a bold claim that seems to lack any credible basis. Where is the evidence that Val had married? There are a number of factors that suggest a marriage has happened, ranging from small peculiarities in Martin’s text to the details regarding Val’s clothing. “You have my word. I did not kill him.” Though I might have if things had gone otherwise. “This is farewell, then,” she said, almost playfully. Notice that she had just kissed Jon. Thereafter the prose reminds us of the color of her cloak—the grey cloak that we later find has been discarded. Then she asks specifically if Jon killed Jarl. Why at this precise moment? It’s because she’s clearly trying to see if Jon may have ‘stolen’ her from Jarl. Val is trying to find out if Jon might believe her to be his spearwife. When Jon confirms that he had no part in Jarl’s death, Val becomes playful. She realizes that Jon does not believe that he ‘captured’ her: he does not consider her his spearwife. Val was clad all in white; white woolen breeches tucked into high boots of bleached white leather, white bearskin cloak pinned at the shoulder with a carved weirwood face, white tunic with bone fastenings. Her breath was white as well … but her eyes were blue, her long braid the color of dark honey, her cheeks flushed red from the cold. In particular, her cloak is different… no longer a brown and grey bearskin but a white bearskin cloak pinned with a weirwood brooch. Dalla was dead, and Mance’s tents were presumably captured. So unless Tormund and his wildlings managed to escape with Dalla and/or Val’s armoire, how did she manage to procure her other clothing? Her explanation here seems so unlikely as to suggest its a coy lie. However, the origins of her garb are irrelevant—what truly matters is that there is clearly an intended symbolism to her clothing. Cloaks are one article of clothing that carry significant symbolism in ASOIAF, particular those worn by women. This is because of the most prominent reason that a woman might dramatically change their cloaks: marriage. And indeed, Val’s cloak changes dramatically: when she departs for Tormund Val is wearing a brown and grey bearskin, yet she returns wearing a white bearskin cloak pinned with a weirwood brooch. Could it be that Val married before returning to Castle Black? Just before leaving, Val is asking about Jon’s ‘marital status’. When Val returns we discover that her cloak—indeed her entire garb— is dramatically different. Val departed for Tormund with an additional concern in mind… her marital and/or romantic future. Such an implication is an attempt to guess at the mind of a character, a feat fraught with dangerous bias. However, the fact remains that Val’s departure was immediately preceded by questions related to a possible ‘spearwife’ relationship between Jon and herself. Why would Val care about whether or not she had some sort of ‘spearwife’ relationship with Jon? How does this tie into the plot at all? Before I begin answering these questions, I’d like to bring up the most amazing discovery that curiously supports Val’s possible marriage: Daena the Defiant. Daena was wild almost from birth. A Targaryen to the bone, she was strong, beautiful, and willful and like the rest of her siblings had Valyrian looks. Her long silver-gold hair was thick and curly, an untamed mane that framed her heart-shaped face and her sparkling purple eyes. To top it off, she had a a fearless “I’ll dare anything” smile. Daena was lithe and athletic. She was an expert horsewoman and also a hunter and a fine archer with her short recurved bow. She worshiped her father and idolized her brother Daeron. Daena’s dress was often as dramatic as she was. As a child, she always wore black in emulation of her father. After her brother Baelor failed to consummate their marriage, she changed to all white, and vowed to wear nothing else until she had been properly bedded, in hopes of shaming him – this did not work. Baelor liked her in white, feeling that it made her look more innocent. Later, as a pampered prisoner in her brother’s court, Daena made several escapes, usually by dressing as a washerwoman or serving girl (once with the connivance of her cousin, Aegon). In particular, it’s rather conspicuous that Daena was another princess who started wearing all white, interesting as it relates to a marriage and it’s consummation. The comment about being an expert on horseback is consistent with Jon’s observations about Val. The coloration of the hair and features, the general beauty. The notion that she escaped her tower by the use of disguise will also prove relevant in the following essay that details the nature of Val’s escape. There are lots of minor characters in the books, it can be all too easy to reach out and find one that substantiates a desired belief and use them to your advantage. Wary of this kind of confirmation bias, we restrict our use of ‘non core-book’ material to only those minor Targaryens that have been given context in the books themselves. By that logic alone, I should not be able to bring up the story of Daena the Defiant on the basis that I’m cherry-picking and using outside sources to establish my theory. Daena the Defiant an incredibly relevant and justified device in my theory. 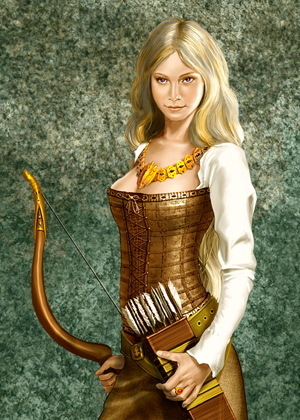 The explicit mention of Daena in the text lends validity to the idea of using her in ADWD-derived theories. Isn’t it further interesting that this excerpt also dwells on whether or not Daena was truly a queen or a princess? The text makes it clear that the difference between being a queen and a princess is consummation – a point I return to later. A final point I would like to make is that Val is also a viable candidate for the ‘grey girl’ which Melisandre sees in her visions in A Dance with Dragons. I refer you to The Error of Her Ways, specifically the section wherein I outline the various manifestations of the ‘grey girl’ vision. Most notably, we can clearly see that Val is strongly associated with the color grey upon her departure, but vastly different upon her return. Even her eye color appears to have changed. I highly recommend reading the section I linked to in The Error of Her Ways if you want more details. In any case, it’s extremely compelling that Val is a ‘grey girl’ and we know that she was slated to be married by Stannis in some capacity. Daena seems to figure conspicuously into the narrative in A Dance with Dragons: from being specifically mentioned, to the many similarities between her and Val, most especially the wearing of all white and the related notion of marriage –particularly a marriage unconsummated. Of course none of this can be construed as definite support that Val is somehow married… but aesthetically, it also seems like a deliberate plant from our dear author. If this theory is correct and Val considers herself married… who did she marry? I’m sure this raises several questions, but allow me to explain. Val is a wildling woman. If she doesn’t want to be Jon’s spearwife, all she has to do is dismiss any claim on his behalf. This calls into question Val’s motive for even asking Jon about Jarl. If she wasn’t at least interested in Jon’s attitude, she wouldn’t have asked—recall her agency. Call me suspicious but this would seem to imply that she was not altogether averse to the idea of a relationship between Jon and herself. Thus Val has a few options if she wanted to believe that Jon had captured her. This also gives her the pretext she needs to just assume that they were somehow married. Further, notice that virtually all of Jon’s subsequent interactions with Val are laced with her playful, teasing attitude towards Jon. Val may have used her “capture” as the pretext needed to assume a marriage. This would be consistent with the idea of a warrior princess, one full of her own agency and control of her destiny—it is plausible. The last line certainly seems to indicate that Val took the initiative or control in their relationship. It’s consistent with the idea of Val’s agency. Could Val claim that they were married as per spearwife or wildling custom, regardless of Jon’s opinions on the matter? Couldn’t she just lie? After all, didn’t Ygritte do much the same thing in A Storm of Swords? On a separate note, Mance’s reference to Val’s lovers being her ‘pets’ is laughably appropriate when you think about how friendly Ghost is with Val. Why on earth would she want to marry Jon, a man who by vows cannot take a wife? First and foremost, she actually knows Jon somewhat. She’d be marrying someone that she knows and is relatively age-appropriate. She knows about his honor and behavior. He tries to be a good man. Had Stannis forced her to make a choice, picking Jon (vows notwithstanding) makes a ton of sense. Is it possible that Stannis would suggest Jon as marriage material when Jon is the Lord Commander—or would Val be acting on her own in this capacity? How is this even plausible? Why would Stannis consider this when Jon is the Lord Commander and bound by the vows of the Nights Watch? they might recognize and respect the authority of her husband. This is a subject I explore in the next section. Val gets a man more suited to her. The wildlings get a new leader who has actually traveled with them, respects them and even brought them through the Wall. Stannis gets the wildling aid and peace he needs, in short term with his private negotiations, the long-term secured by the union of Stark and wildling. It would net Stannis that child of House Stark he was so desperate to establish as new the Lord of Winterfell. I return to the observation that Val made three attempts to escape Castle Black prior to Mance’s execution. In one chapter Gilly said that Val would agree to marry anyone as long as Mance was allowed to live. “Mance” was indeed killed and yet Val makes not a single attempt to escape thereafter. This strongly suggests that Val knows Mance’s is alive, and per her offer to Stannis has peaceably agreed to marry. This is the only sane explanation for her subdued behavior. I have yet to mention perhaps the biggest reason for a union between Jon and Val: it dramatically improves the effectiveness of any wildling-led false flag attack on the Dreadfort. This is a subject that I explore in a later essay, Forging an Oathbreaker. The timing of Val’s changing garb is also important. You’ll notice that she started wearing the white after meeting with Tormund. If it’s true that a change of cloak may indicate a change in marital status then it’s plausible that it means Tormund and/or others know it at well. If the chieftains of the wildlings knew that Val was “married” to Jon, how might that affect their behavior? ...Howd Wanderer swore his oath upon his sword, as nicked and pitted a piece of iron as Jon had ever seen. Devyn Sealskinner presented him with a sealskin hat, Harle the Huntsman with a bear-claw necklace. The warrior witch Morna removed her weirwood mask just long enough to kiss his gloved hand and swear to be his man or his woman, whichever he preferred. And on and on and on. Seriously. These were people who were giving up their own children as hostages. I find it odd that they were so enamored with Jon that they forgot the sons they had handed over. It seems completely bizarre that so many of these chieftains surround Jon with an aura of respect or admiration—one that seems wholly unfounded. Perhaps this is just a noteworthy-but-trivial detail. However, this is not the only time the wildling chieftains behave in an uncharacteristic manner. It’s odd that none of the wildlings (or members of the Watch for that matter) show any suspicion regarding the fact that Mance survived his execution. I’m once again reminded that these chieftains seem bizarrely zealous in their support for Jon. Could it be that they think he’s married to Val? Might this suggest that the wildlings believe Jon is enthralled by Val, able to be manipulated by her—that she is somehow in a position of power? Jon Snow did what Mance Rayder could not, he got the wildlings through the Wall. Title or no, Jon’s been a more effective “King-Beyond-the-Wall” than Mance was. Val has the capacity to force Jon into pursuing her. Clearly, Jon has given his word that he will keep Val hostage. Thus if Val escapes, Jon is beholden to retrieve her. It is in this fashion that Val can compel Jon’s pursuit—thereby controlling him after a fashion. If Val does escape Castle Black with Jon Snow in pursuit—or even a willing participant—where would Val go? This is where I tie the various threads in this essay back to Stannis’s high-level strategy and the proposed false flag attack on the Dreadfort. I believe the arguments concerning secret negotiations and establishing the ‘window of opportunity’ are extremely compelling. You may be hesitant to put any faith in the later theory of a secret “marriage” to Jon Snow. However, I have painted only half of the picture. You will note that this essay is devoid of any details concerning the actual nature of Val’s escape. This is intentional, this essay was purely about establishing the motives and underlying strategy of a wildling false flag attack. Val will lead a small host of wildlings in a false flag attack on the Dreadfort. Jon will follow in hot pursuit, or alternatively a willing participant in the attack. The Boltons will be notified of wildling force and move to either recapture the Dreadfort, or fortify it against a wildling attack—depending on the movements of both forces. Subsequently, Stannis—playing dead outside the walls of Winterfell—would have an ideal opportunity to steal Winterfell after the Bolton armies marched from the castle. The details of how this mission is to be executed can be found the next essay in this series, Honor Has its Costs. Said essay also provides even more evidence which supports the existence of a secret alliance and a corresponding mission. An interesting tidbit I found, though I’m not sure of its significance. You mention Wun Wun possibly being deliberately given wine by Val and/or Leathers to provide the distraction for Val’s escape. The text, in fact, provides one reference to a “drunken giant”, though not a literal one. When the invasion of the previous King-Beyond-the-Wall, Raymun Redbeard, is discussed, he is described as being defeated in battle by the forces of the North. The two commanders for the Northern forces are the Lord of Winterfell, Willam Stark, and Lord Harmond Umber, colloquially known as the Drunken Giant. So we have a historical, figurative “drunken giant” playing a key role in bringing down the previous King-Beyond-the-Wall, and now we have a possibly, literal, drunken giant, playing a key role in the plans of the current King-Beyond-the-Wall. I can’t remember the exact locations in the text for where the story of Raymun Redbeard’s invasion is told, or who does the telling, but this seems to possibly tie in with your idea. Ok, I found the mentions in the text. The story of Raymun Redbeard first comes up in Jon II, when Jon is ruminating on how the Wall’s weakened defenses have been exploited in the past. Raymun is then mentioned briefly by Tormund Giantsbane in Jon XII, when he indicates Gerrick Kingsblood’s son to Jon. Finally, in Jon XIII, Tormund brings up the story again (including a reference to the Drunken Giant) when he arrives at Castle Black with his 50 men. Two things are of note here. First, Jon notes that Tormund already knows about Gerrick Kingsblood claiming to be King-Beyond-the-Wall, even though the previous paragraph notes he’d only just arrived, which supports the idea that Toregg had passed key information to his father prior to that point. Second, Val’s escape attempt would have already been under way by the time of Tomund’s arrival, perhaps making his unprovoked “drunken giant” reference particularly significant. I have been discussing with Jeff Hartline (/u/BryndenBFish) the idea that the whole battle at Long Lake may be another partial inspiration for Stannis’s Night Lamp. I agree that the ‘drowned giant’ reference to the islands may be significant, but in my mind it might only be the prose itself, suggesting a connection to Long Lake in the sense that the enemy was pinned between the Starks and the Drunken Giant (an Umber) and the wildlings were wiped out along the shores of Long Lake. With easy connection between drowned and drunken, its possible that the the metaphor could be that the Freys would be pinned between the Stannis forces on the shores and the weirwood island (the drunken giant), to be wiped out along the shores of the lake. No offense but…uh…can I get a TL:DR here? That would be really thankful. Hey there. I just saw this post (12/10/16) and I love it. I am rather invested in this part of the main story and have done a bit of writing on it myself. I see you asked a few questions in this post that I answered in my own write-up on the Westeros forums. I would be beyond honored if you would take a look (when you can). Incase the link does not show up, the thread is titled “Nymeria is poised to return”. I started it about 6 months ago and have added bits and pieces along the way and am up to the point where we are at the mutiny stabbing. Great essays. They make GRRM’s ASOIAF books so much more fun to read. One question based on what you have made evident in this essay “the captive must obey”. It would seem Val did in fact manipulate the unwitting Jon and thus wildlings into believing that she had married Jon with the intention of cementing the reveal to Jon by having him rescue her from the DreadFort. Given you have plausibly demonstrated your theories on Val, is it therefore not unlikely that Melisandre likely allowed the murder or attempted murder of Jon (since we don’t know if he truly is dead) as a means to either have him “believe he has died and been revived” and thus free of his Oath to the NW or give him reason to “purge” the NW? If he died (or was made to believe he died) and was revived, Jon would be free of his Oath to the NW. He would also have reason purge the ranks of the NW of any Brothers who had allegiances to Kingslanding or failed to realize that the coming Others were a greater threat and that the wildlings were needed to depend the Wall. Even if a revived Jon did not feel his death released him from his Oath to the NW, Jon would still purge the ranks of the NW after his murder. This would ensure that there would be no-one who could object to use of NW manpower/resources to rescue Val from the Dreadfort in Jon’s efforts to keep his word to Stannis to keep Val secure. The need to heal/revive Jon or simply to protect against potential NW mutiny would be a stronger reason to leave Melisandre at Castle Blank then simply the need to relay communications to set the Dreadfort attack in motion. If Stannis planned to recapture the North in such detail it would seem unlikely that he didn’t have a contingency plan to prevent or capitalize on a potential mutiny in the NW against Jon.